Chrichton's World: My thoughts on season 2 finale Fargo: How can you end like this? 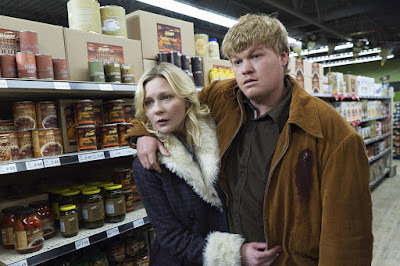 My thoughts on season 2 finale Fargo: How can you end like this? The first season of Fargo was excellent throughout and I can't recall one bad moment in that one. It was one that kept building up to a wonderful climax and delivered. This time around the show steps up a notch and gave us more crime and dramatic deaths with a whole cast of weird and intriguing characters. Every episode until the last was filled with thrills and tension working up to something devastatingly beautiful. At least I hoped it would. The final episode of season 2 is exactly the opposite of the nine previous episodes almost making a mockery of all the drama that has occurred. Of course one could argue that Fargo has always been parodying the crime genre and that the whole idea is that it's all pointless. And if they had continued the road they had taken in the first season I would have bought it. Except season 2 was far more conventional than season 1 was. It was far more predictable and it tried to mix in too many characters that made it hard to root for anyone. The brilliance of season 1 was that even when Billy Bob's Thornton character Malvo was evil incarnate you were rooting for him all the way. Other characters like Lester Nygaard were far more immoral and despicable. There was a bigger contrast between these characters that made it far more interesting. You simply had no idea how it would turn out. And while the most part revolved about one crime and the consequences of it there was much more at stake. Season 2 basically starts with one crime as an excuse but then follows every classic gangster film you can think of. Which was done superbly although I couldn't help but thinking how some people stated loving Fargo but at the same time not realizing that they were watching a copy of better films. Then again there was still a quirkiness to the show that kept it fresh and compelling. It is therefore a complete mystery why they decided to end the show like they did. It lacks the punch most of us were hoping and expecting. Actually you would think that the aftermath of the events in episode 9 and before would have had a bigger impact. And it is incredibly disappointing to see that in essence none of what had happened has any real consequences. Most characters ended at the same point they started. Except for Hanzee who suddenly is incredibly ambitious. Say what you want about Lester but he went from a normal and boring person to a dangerous and interesting individual. That is what made the original season so brilliant. Season 2 ends like nothing of importance has occurred no matter how gruesome and dramatic the events were. I am sure the makers of the show are going to say and defend that this ending was intentional and that the finale is filled with references and tie ins that supposedly should rock your world. Only it didn't. I did not care that much about Molly and her father in the original that much. But it was nice. The Hanzee thing was too far fetched and again a tie in to a character I can't even remember. Am I supposed to be impressed by this. I really think that the writers had no idea how to end and that they just made stuff up at the last minute. Because it certainly feels that way. Does this matter overall? Just a little. It's like you had a wonderful dinner throughout and then the dessert that is supposed to be sweet and delicious tastes bitter and sour. Season 2 was good and strong until the last episode. It deserved a much better conclusion than it did.